Jars with this decoration are quite common on the antiques market but hardly any description of them are published. 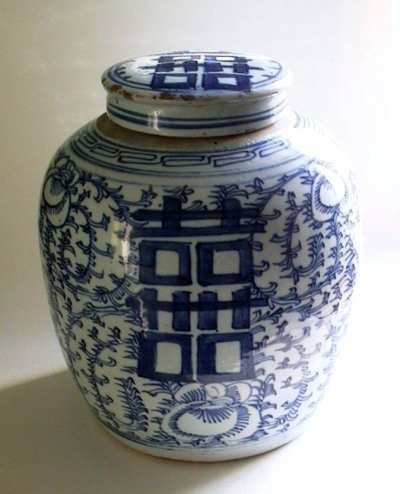 These jars have become a standard item among interior decorators who wants to add an Asian flavor thanks to its generous proportions and charming associations to the mysteries of foreign lands. It's decoration in underglaze blue and white cobalt decoration is of sweet pea vines, symbolizing "forever" and "many children". The main decorative item is a "shuang (double) xi" (joy/bliss/happiness) character which is the recognized symbol of "wedded bliss". These jars mostly belongs to the later part of the Qing dynasty, meaning mid 19th century up until the first decade of the 20th century. From a collectors point of view it is worth noticing that the lids are much more rare then the jars, and that the price for a Jar with lid often is twice that of one without a lid.